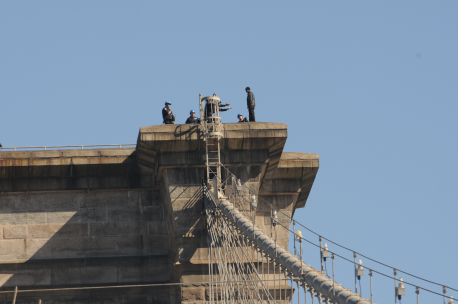 After receiving a call on Saturday that a man was standing on the Manhattan tower of the Brooklyn Bridge threatening to jump, NYPD arrived at the scene, donned harnesses, and climbed up the cables to talk the man down. First to arrive at the bridge were detectives Keith Connelly and Gregory Welch. Without hesitation they put on harnesses and began the climb to the top of the tower. According to police reports the detectives waited until Sergeant John Flynn joined them before engaging the man. The police spoke with the “jumper” for over an hour before he decided to come off the bridge with the policemen. The man agreed to descend safely after the officers “were able to ascertain the man’s concerns and issues.” He came down without a struggle with Emergency Service Officers after the man was convinced that they would help him get the aid he was seeking. When the group reached the safety of the road the 52-year old black man, whose name was not released yet, was brought to Bellevue Hospital for an evaluation.